The Donington Historic Festival, one of the world's premier events for classic motorsport, is rapidly approaching (3-5 May), and there is no better way to enjoy the event than with one of our VIP hospitality packages. The Festival attracts a glorious selection of rare and glamorous machines from as far back as the 1920s, with an epic race timetable featuring retro saloons, single seaters and sports cars. Our hospitality suites, located at Redgate and Goddards are right at the heart of the action, with excellent views of the on track activity, and all come with outdoor balconies or terraces, as well as providing easy access to the huge variety of entertainment and display areas. Our silver package for this event is priced at just £85 plus VAT per person per day (Saturday and Sunday only) and includes entrance tickets to the circuit and suite with privileged parking. Once inside you'll be able to enjoy morning coffee with breakfast rolls, a two course buffet lunch, sandwiches and cakes with afternoon tea, with a pay bar in operation. The suites are fully equipped with live timing and commentary, as well as official souvenir programmes and free Wi-Fi. Superbly located deep within an event full of glamour, there's no better way to entertain guests, friends or family at one of Donington's most prestigious events. 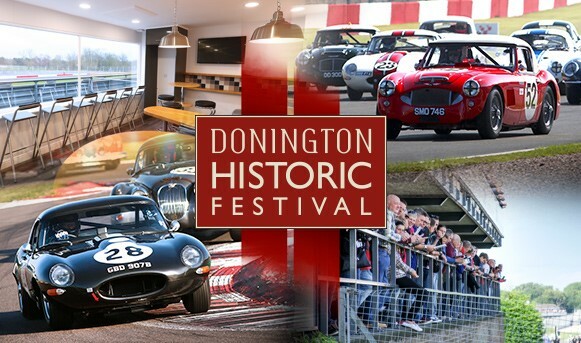 To book VIP Hospitality at the Donington Historic Festival, click the button below or call our dedicated team on 01474 875224.